Note that this blog will no longer be relevant after the Rules of Golf revisions dated 1st January 2012 become effective. 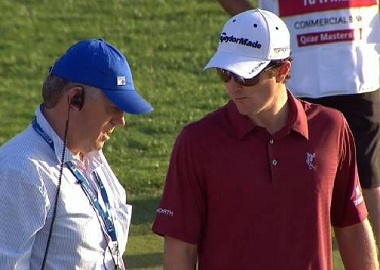 Justin Rose incurred a one stroke penalty on his opening round at the Qatar Masters on Wednesday. After he had addressed his ball, by grounding his putter immediately behind it, for a tap-in par on the 17th green, he saw it move. Fortunately, he called for a ruling because it later transpired that he and his two fellow competitors, Martin Kaymer and Louis Ossthuizen, all thought that, following the amendment to Rule 18-2b on the 1st January last year, there was no penalty when the ball moved. The amendment to the Rules that had confused these three players was the introduction of the Exception to Rule 18-2b that I have underlined above, which was not relevant to the circumstances of Justin Rose’s breach, as his ball was definitely not moved by wind, water another element or an outside agency. "I think that's happened to a lot of guys in the past. To cut to the chase, the greens aren't perfect and have a lot of ridges and humps and hollows. "It was just unfortunate timing that as I put my putter behind the ball, which I know didn't cause the ball to move, the ball was finding some indentation. "I'm deemed to have caused it to move even though in your heart of hearts you know you haven't. "There has been a change in the rule, but that only applies to a wind gust, when you are allowed to place it back without penalty. "Unfortunately I was on the wrong end of it, but I guess that's the good thing about golf – you have to self-police out there. Nobody else in the group saw it, but I knew the ball had moved when I addressed it." Was Justin hard done by? Maybe, but it is also possible that he did cause his ball to move when addressing it. I am sure that most of us have experienced situations when we have grounded our club close to our ball and the fact that we have moved grass growing beneath our club has had a ‘domino effect’, resulting in our ball moving off its lie, even though we did not actually touch it. Could Justin have avoided this penalty? Yes, but it would have meant altering his pre-putt routine, which is not an easy thing to do. By not grounding his club immediately behind his ball (see this blog of mine on this subject), he would not have addressed his ball according to the Definition. When the ball then moved and there was no evidence that he caused it to move, no penalty would have been incurred and he could have played the ball from its new location (Decision 18-2b/4). Not grounding your club when you think that there may be a chance that it might move is just one of my '99 tips on Using the Rules of Golf to Your Advantage'. A great help for only $8 / £5. Click here for more details. If you would like to see how confused the players were over this Rule and how even the Referee took several minutes to make and explain what should have been obvious to everyone, then check out this six-minutes video, courtesy of the excellent GolfChannel.com on-line resource. If only more tour players would read my blogs! Morgan Pressel had the same experience and result in the LPGA event in Vancouver, Canada in 2012. She was of the same mind as Mr. Rose - that the Rule had changed to no penalty. Thank you Barry for your good work. The new exception to rule 18-2b definitely has caused confusion among players. Even after this exercise it seems Rose still misunderstands it, i.e. if he is correctly quoted. "There has been a change in the rule, but that only applies to a wind gust, when you are allowed to place it back without penalty“. This, of course, is not true. If wind is deemed to have moved the ball you should not replace it. "There has been a change in the rule, but that only applies to a wind gust, when you are allowed to place it back without penalty." Looks like he still doesn't quite get it. Oh well - it keeps us referees un an unpaid job I suppose. I was informed by another subscriber that Justin Rose had used these words in an interview, but could not quite believe it, so I left it out of my blog! Thanks for the confirmation. Mr. Kaymer seems to need a rules refresher. This is the second time in a few days he didn't get it right.